Min. 2 nights. Sleeps 6 + 1. Three bedrooms, two bathrooms. 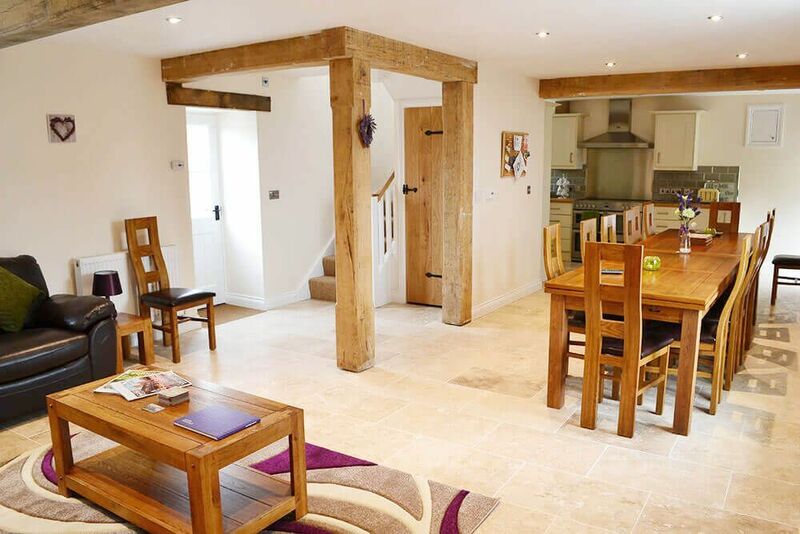 Poppy, sleeping six + one, is one of four delightful stone barn conversions situated at Webbington Farm, a working beef farm in the beautiful Somerset countryside. Forming an ‘L’ shaped courtyard and surrounded by plenty of open space, lush meadows and wildlife, the cottages provide an ideal base to get away from the hustle and bustle of everyday life. Each of the cottages has its own large patio area equipped with outdoor furniture, as well as shared use of a games room and a large enclosed lawned garden with a barbecue and children’s activity play area across the courtyard. The cottages also boast their own river frontage on the River Axe for private fishing. As a family farm, there is opportunity to see the animals and experience ‘life on the farm’ at close hand. Complimentary tours of the farm and the opportunity to watch the neighbours cows being milked can be arranged. The owners are very keen on the environment and have planted 10,000 trees into a woodland, replanted an apple orchard and are involved in a number of schemes promoting good environmental practice, including a reed bed. Poppy, named after the owners’ granddaughter, is an oak beamed cottage with modern facilities, finished to an exceptional standard. The spacious open plan living space comprises sitting, dining and well-equipped kitchen areas. The sleeping accommodation comprises one double with en suite shower room, one twin and one triple bedroom. The family bathroom has a P shaped bath with a shower over. The private patio to the front of the cottage is a delightful spot to sit and relax in at any time of day. The other three cottages at Webbington Farm are Kitty (sleeps 4), Tiarks (sleeps 5 + 2) and Golightly (sleeps 4 + 3). All three cottages can be booked together for larger groups to sleep up to 25 guests. Please see Webbington Farm Cottages http://www.staycationholidays.co.uk/holiday/webbington-farm-cottages-somerset/ if you are interested in this option. A rustic party barn is also available for hire when accommodating larger groups. The Barn comprises a bar, seating for 30, a wood burner, sound system and room to party the night away. Catering is available on request. Spacious open plan living space comprising a sitting area, a dining area and a modern fitted kitchen area. Double bedroom with a 5′ double bed and en suite shower room. Triple bedroom with 5’ double bed and a 3′ single bed. Family bathroom with a P shaped bath with shower over. A charming stone barn renovation situated on a working beef farm in the beautiful Somerset countryside. Experience ‘life on the farm’ at close hand – a visit to see the cows being milked and tours of the farm can be arranged. The cottage boasts its own river frontage on the River Axe for private fishing. Designed with your comfort and relaxation in mind and tastefully furnished, with a sociable open plan living area. Private large patio sitting area and hot tub room and shared use of a games room, children’s activity play area, large enclosed lawned garden and barbecue. The three other properties at Webbington Farm, Kitty (sleeps 4), Tiarks (sleeps 5+2) and Golightly (sleeps 4 + 3), can be booked with Poppy to create a large property for family get-togethers or groups of friends of up to 25 people. Cottages may be taken individually or in any combination. Brilliant in all seasons and the ideal setting for Autumn and Winter breaks. From country walks to Christmas markets, the outdoors can be enjoyed at the most unexpected times. The barn is warm and cosy with central heating and comfortable beds. To make your vacation unique, additional services can be arranged on request, including a personal Chef, golf day passes and packages, clay pigeon shooting, wine tasting, outdoor pursuits, cakes, beautician, cocktail making, hairdresser & horse riding lessons. Accommodation includes day passes, according to the length of stay, to the nearby Webbington Hotel’s heated indoor pool, sauna, steam room, tennis courts and gym facilities. Perfectly located for exploring the stunning Somerset countryside and coast. There are a great range of walks up into the Mendips and beyond where guests can enjoy the array of wildlife that freely roam over this breathtaking landscape. Within easy reach of the culture-rich cities of Bath and Bristol, the picturesque scenery of Cheddar caves and gorge and Wells, the smallest city in England. The vast majority of holidays are a complete success but things can go wrong from time to time and it is essential to discuss any problems with us at the time of the occurrence. We are committed to ensuring the success of your holiday. Regrettably, we cannot accept any complaints, which have not been brought to our attention at the time of occurrence. Any complaints not resolved locally must be confirmed in writing within 28 days of your return. First floor: En suite shower room to double bedroom. Family bathroom with a P shaped bath with shower over. Sorry, no pets are allowed at this cottage. Please bring your own swimming towels. If booking with Tiarks cottage, please bring your own towels for the hot tub. Minimum stay 7 nights during Summer High season. When booking more than one cottage, the dining area can seat 12. Poppy is nestled below Crook Peak on the edge of the Mendip Hills Area of Outstanding Natural Beauty, with scenic walks to its summit offering views of the Somerset Levels as far as Glastonbury Tor! Amidst Somerset’s famous cider making and Cheddar strawberry growing area, the location is ideal for guests looking for peace, tranquility and the great outdoors. Fishing, kayaking, canoeing, archery, air rifle & pistol target shooting, walking, horse riding and golf are all catered for locally. Guests are also provided with day passes, according to the length of their stay, for the nearby Webbington Hotel & Spa facilities which include an indoor swimming pool, gym, spa, tennis courts, bars and restaurant. To make your vacation unique, additional services can be arranged on request, from your own personal chef and beauty treatments, to clay pigeon shooting and cocktail making to name but a few. Poppy makes a superb base for exploring the surrounding countryside and coastline. Within easy reach are the impressive gorge and caves of Cheddar and Wookey Hole, the cathedral city of Wells, historic Glastonbury, the Georgian city of Bath and the home of Isambard Kingdom Brunel: Bristol. For further retail therapy, Clarks Village at Street is an easy drive. The Somerset coast is equally close to hand with Weston-super-Mare, Brean Sands and Burnham-on-Sea offering the holidaymaker a variety of activities including golf at the championship course at Burnham & Berrow.